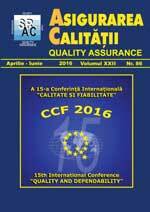 ASIGURAREA CALITATII - QUALITY ASSURANCE is an international scientific journal aimed at disseminating significant theoretical and practical results in the field of quality and dependability (reliability, maintainability, availability, safety/security a.o.) engineering, assurance and management. The journal ASIGURAREA CALITATII - QUALITY ASSURANCE is published under the aegis of a distinguished International Editorial Board, composed from top specialists (mainly, university professors) in the field from 13 countries. The geographical distribution of the members of the International Editorial Board assures a wide coverage for this journal. All the others members of the International Editorial Board are representative names for the domain of quality & dependability and assure a high scientific & professional standard for this publication. The journal was published beginning with the year 1995, and became an international journal from the year 2000. Editor-in-Chief: Ioan C. BACIVAROV, PhD. Prof.
For any information please contact us at contact_at_asigurareacalitatii.ro.